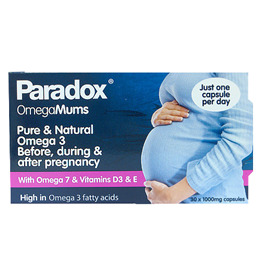 Paradox OmegaMums - Omega 3 & 7 + Vitamin D3 is a pure and natural Omega Oil supplement that is aimed at mothers for all stages of pregnancy - before, during and after. It maintains the health of the foetal development in expecting mothers. 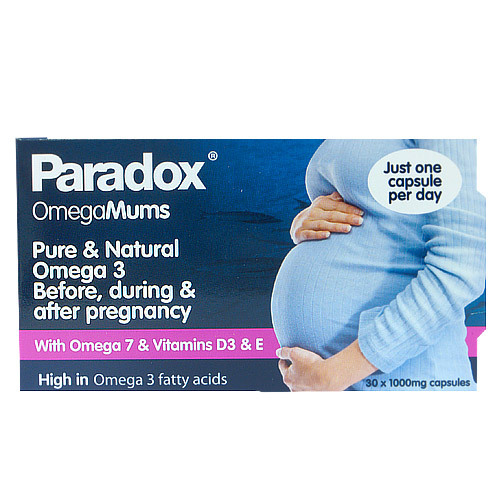 The fish oil in the Paradox OmegaMums is a mix from herring, cod, anchovy and sardines. All of these fish are sourced from the icy waters of Iceland. Taking Omega 3 fatty acids before you become pregnant is important in preparing the body with sufficient levels, as is keeping levels sufficient during the progress of pregnancy. Mothers transfer DHA to their foetus during pregnancy to support optimal neurological development. DHA is essential to supporting optimal foetal brain, eye, immune and nervous system development. Omega 7 may help to maintain natural lubrication of mucous membranes such as, vaginal, mouth, eyes and digestive tract. Healthy mucous membranes are important for general health and well-being. Vitamin D has a beneficial effect on maintaining bone health, cell growth, supporting the immune system and cell metabolism. The impact of vitamin D deficiency on the developing foetus and maternal health is now a significant concern and a high prevalence of vitamin D deficiency is now recognized in pregnant women. Pure fish oil (from herring, cod, anchovy, sardine), pure extra virgin olive oil, pure organic lemon oil, Capsule: fish gelatin bp, glycerol bp. Women 18+: Take 1 capsule daily. Pregnant women should consult their doctor before taking any mineral or vitamin supplements. Food supplements much not be used as a substitute for a varied and balanced diet and a healthy lifestyle. Below are reviews of Paradox OmegaMums - Omega 3 & 7 - 30 x 1000mg Capsules by bodykind customers. If you have tried this product we'd love to hear what you think so please leave a review.